Using editable voxels, Novaquark empowers its Pre-Alpha community to take on the role of level designer as they terraform the universe, build complex outposts from scratch, and lay the foundations for Dual Universe’s future. Following hot on the heels of the recent launch of Supporter Packs, Novaquark is excited to share its latest trailer for Dual Universe, showcasing the incredible freedom and depth of creation available to its community. By using the game’s editable voxel tools, the resulting structures built by the players during the ongoing pre-alpha represent an early look at what new players can expect to encounter as they dive into this ambitious, large-scale sci-fi sandbox for the first time. While the term “voxel” tends to evoke images of cube-shaped building blocks, Dual Universe delivers a proprietary voxel engine that affords players much more control in manipulating the world - and universe - around them. At a simple level, players can place and manipulate fully editable blocks that come in all shapes and sizes as they build canyon-filling cities or spaceship fleets. For players who want to get a little more granular, this voxel engine allows them to terraform at will, carving away at a planet’s surface, and digging complex cave systems that could one day house an organization’s base of operations. Dual Universe is available now in Pre-Alpha. In addition to being the 3rd biggest worldwide Kickstarter of 2016 for a video game, it earned over one million dollars in funding on both Kickstarter and its official website, and boasts a vibrant community of over 10,000 backers and almost 1,900 in-game organisation communities. UNIVERSE (available in test version): The first fully editable universe made for players by players. The only limit is your imagination! Gather your friends and build on a truly epic scale, from ships, cities and space stations, to Lua scripted puzzles and interactive constructs. 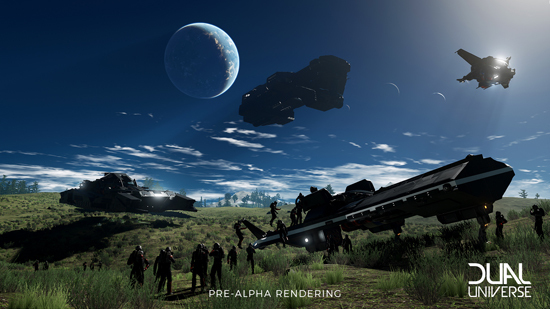 MASSIVE (available in test version): Dual Universe is the first game where potentially millions of players can interact together simultaneously, inside the same giant universe. We call it the Continuous Single Shard Cluster (CSSC) technology. This proprietary technology means no multi-server player separation, instances or loading times, just one enormous, persistent universe. EXPLORATION (partially available in test version): Explore & Discover new worlds with your friends, find rare resources and build the greatest place in the universe. Will you be a nomad treasure hunter, or a calculating profiteer? ECONOMY (work in progress): Dual Universe will have the most realistic economy system ever made in a game. From weapons and tools, to spaceships and giant space stations, build and trade everything to everyone - at your price - on your own market. WARFARE (work in progress): Fight for supremacy, resource control or geostrategic advantage, as you join with fellow players and create your own defence systems, build warships, cities and space stations. Will you defend yourself or lay waste to your enemies? POLITICS (work in progress): Be a lone wolf or choose an organisation or build your own, hire new players, fight other alliances, cut deals with them or rule your own part of the Universe with this completely open political landscape, full of emergent gameplay opportunities.